Great news!!! The Board of Director’s approved a mid-year abatement of assessments in the total amount of $200.00 to be applied to your June & July 2018 billing statements. 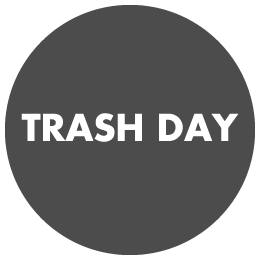 Therefore, please take a moment to inspect the wrought iron fencing in your rear yard, the back section only, for any areas that may have appeared to have accidentally been missed or need touch up. 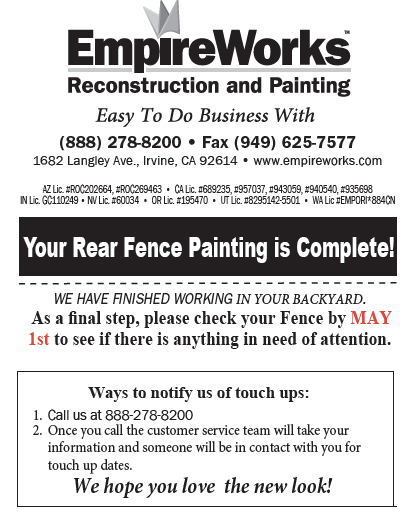 If you discover any of the aforementioned concerns, or if you had items affixed to your rear yard fencing, and/or Empire Works could not access your fencing during the initial rotation, please contact Empire Works directly at (888) 278-8200, no later than May 1, 2018, so they can address the matter accordingly. We are excited to announce Alberhill Ranch Community Association’s newly designed community website. Residents can can obtain the latest newsletter, board meeting minutes, forms, community rules and regulations and much more! Also, the management contact information is located under the Contacts Section titled Keystone Pacific. Don’t forget, you can also check your billing account by accessing the View Statement/Pay Bill page under the Navigation Menu. Please see below for the Ranger Pro MSDS and Label. Please visit The KPPM Connection! Please log in using your account online email address and password. If you have not registered, please have your billing statement available to enter in the required information. If you need assistance, please contact Customer Care at (949) 833-2600 or customercare@keystonepacific.com. For added convenience, we also offer an ACH program in which your monthly assessment payments are automatically deducted from your checking or savings account. You will no longer have to remember when to pay your payment, write a check, or pay for any more postage! To sign up, please download a copy of the ACH Form.